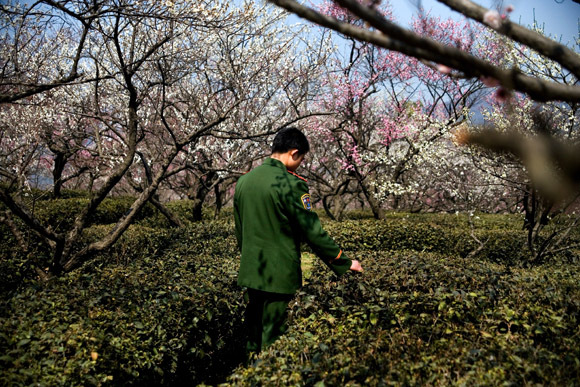 An Army soldier stands in a field of plum trees during the Nanjing International Plum Blossom Festival at Zijin Shan outside of Nanjing, China. I’m excited to announce I’ll be presenting my series, China Everbright, at Shanghai’s Dada club on Wednesday, March 24, 2010, at around 8pm. The event was organized by the multi-talented Tim Franco, who’s been spearheading the monthly event and drawing quite a crowd. I was in Xian over the weekend and met some people from Shanghai who knew about the event and were planning on being there. If it lives up to previous photographers nights at the club, it’ll definitely be the place to be on Wednesday. Check out the facebook event page. I know Matthew Niederhauser will be there showing some work, and there will be a few Chinese photographers as well. If you’re there, please say hello.